I’ve been extremely slack with my blog, but as I’m stepping things up with both my tablet weaving, and my tablet weaving classes, it’s time I step things up here. I’ve done a lot of weaving, but none of the pics have been posted. I need to get some of them up here so that I can show people what I’ve been doing, and what I have available for purchase. 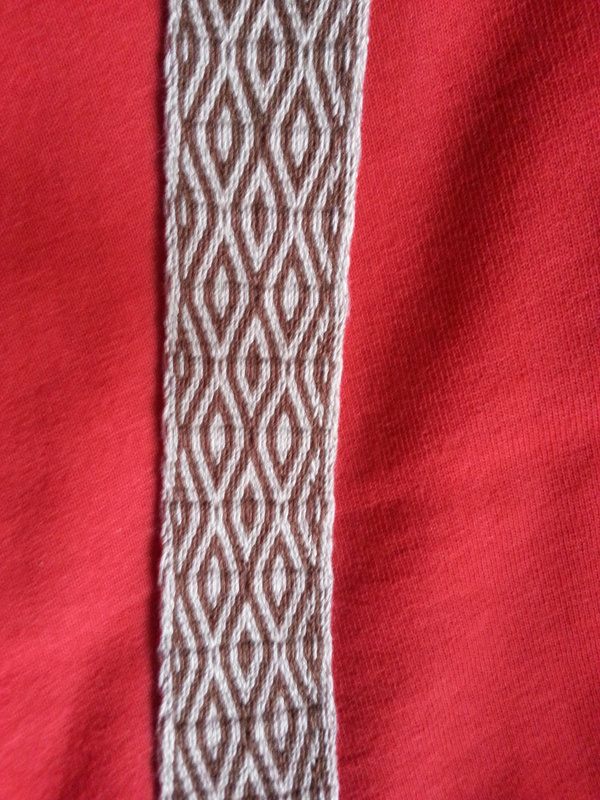 For now I’m going to show the two most recent bands woven on my trusty loom, Loomer. They are both woven out of bamboo in mushroom and nutmeg, for a cinnamon brown linen tunic I’m making for Stacy (hopefully for GNEW). This first one was a simple 4X4 what I stretched to being a 5X5 to make the pattern more interesting. I’ll be using this around the bottom of his tunic. It measures 98″. 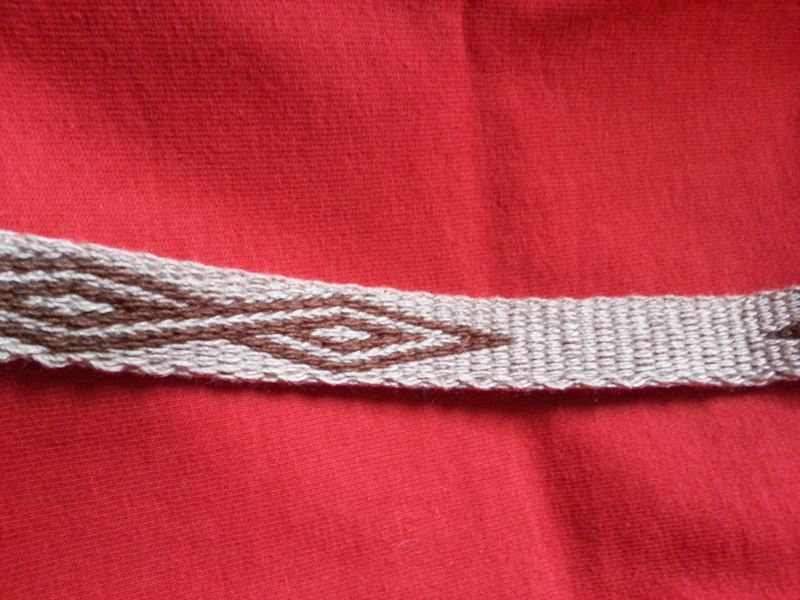 The next couple pics are double-face weaving that will go around the cuffs of his tunic. It is 88″ long. 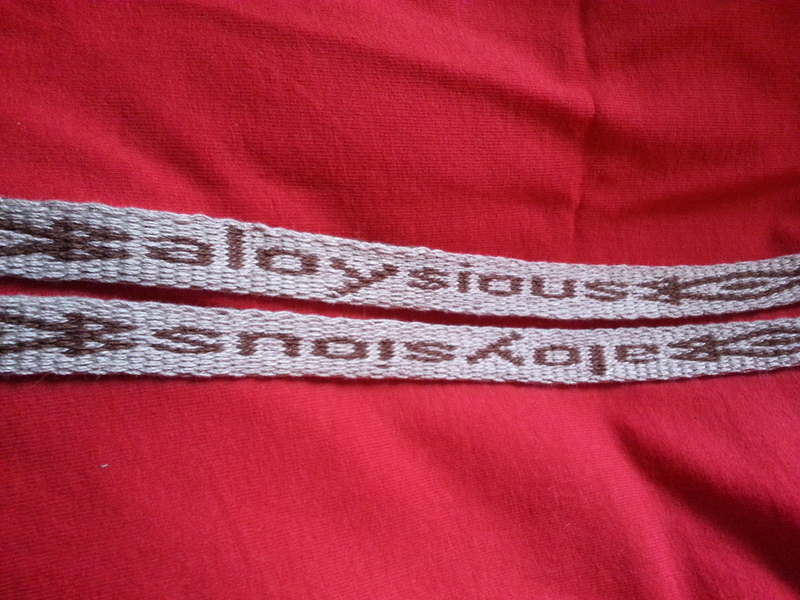 Yes, that says Aloysious, his SCAdian name. 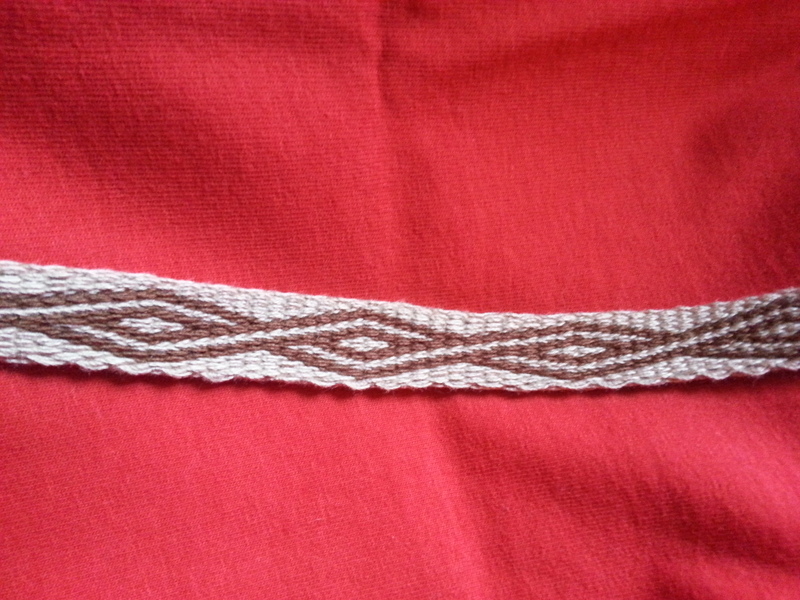 These next pieces of band are also double-face woven, and will be around the neckline. The diamonds will come down around the neck. The blank bit will be where I fold it into a point before running it back up the other side of the neckline. I know it seems like a lot of medieval bling for one tunic, but I will be teaching a couple of Beginner Tablet Weaving classes at GNEW, and I’d love to have something to show off to the people taking the classes. Hopefully within the next week I will be able to get up pictures of Stacy in his tunic with the bands attached. Fingers crossed. Keep checking back as I’m going to work hard to get something posted here at least once a week, showing what I’ve been weaving each week. – I’ve eaten supper, did an hour of actual work (like stuff for my boss). – Ironed five yards of brown linen. – Cut out a T tunic from one Stacy already has. – Sewed the side seams, cuffs and hem. – Attached the wide diamond trim around the bottom – by machine. Yes, all of that is done! 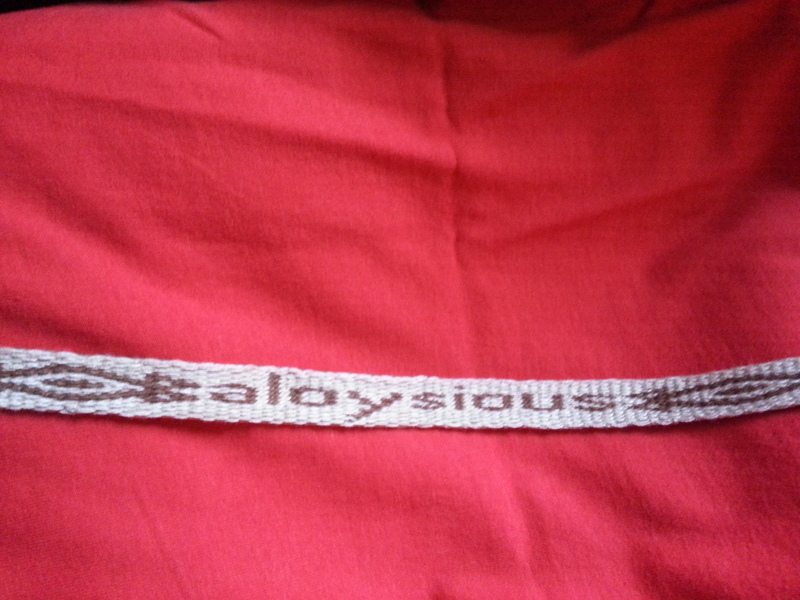 So, tomorrow all I have to do is attach the Aloysious arm bands and connected diamonds neck band. Fingers crossed that I can bet the rest attached as I’m doing that by hand. Bringing nobility to pro wrestling news and opinion.